NeeNee's Blog: A much better Friday...Praise the Lord! A much better Friday...Praise the Lord! Well, today started off a little rocky when I went into Fletcher's unit and they told me he had pneumonia. My first thought was 'great this is just what he needs!' UGH! So, I walked over to Fletcher's bed and he was on his tummy (to help his lungs and not a normal position for him) and he was having bloody nasal secretions. Double UGH! They were also giving him breathing treatments every 30 minutes for a few hours and then they changed the treatments to every two hours. They also had given him IV Lasix to help with the fluid in his lungs. They told me I could hold him so I picked him up immediately and he was so HAPPY to see me. I totally enjoyed my morning time with him. We sang songs and he did all the motions and he smiled and laughed, it was a perfect morning. I did not have a babysitter today so Maddie and I stayed home this afternoon. But once Kayleigh was home from school I went back to see Fletcher. Again, he was happy and had the biggest, sweetest smile on his face when he saw me. Not long after I got there one of the nurse practitioners came and told me that Fletcher was responding well to the breathing treatments and Lasix and that his lungs sounded a lot better. She also told me that the cultures came back and there was NO yeast or mold! Meaning it's not a fungal infection! 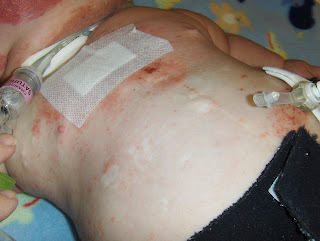 The rash is probably impetigo, which I'm guessing isn't a fungus, they will continue the IV antibiotics. So, now about that central line. I am choosing to believe that the Lord was the one who made that happen. That line was TUNNELED into a vein and SUTURED into Fletcher's skin. How would it just fall out? He never messed with it so I really don't think he pulled it out. The line will have to be replaced. It's very important especially in times like we're going through right now that he have a line accessible for IV meds. They'll try for a more permanent thing like a port, but we've tried that twice before and we were told that Fletcher has too much scar tissue from his heart surgery and all of the previous central lines he's had in the past. I, personally would love for Fletcher to have a port because it would be under his skin, meaning that would be one less thing 'hanging' out of his little body. So, the surgery is set tentatively for Monday, November 12th. We won't know until Monday morning the time of the surgery. I will keep you posted about the surgery. I am posting two pictures I took today. I wanted you all to see the rash and the place where his central line used to be (under the white bandage) the second picture says it all. 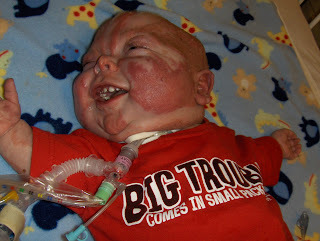 He's happy and the little t-shirt he's wearing says, big trouble comes in small packages! Yep, that pretty much sums it up! But it's 'trouble' I'm willing to go through if it makes his life better! Thank you all so much for the encouraging emails and comments. They really make a difference. Thanks for spending time in prayer for my Fletcher and the rest of us. I KNOW the Lord is hearing your prayers! Yes, Fletcher, big trouble does come in small packages! Okay, I am blown away at all that has happened this week. I haven't been blogging much and have missed all your prayer requests, and praises. I am joining you in prayer this morning for Fletcher and his surgery on Monday. I have no idea what you are going through, but I can remember the days before a surgery well in thinking about my husband's two hip surgeries and my son Seth's surgeries. I remember when he had a central line put in after all his veins were unable to work for mediations needed. I was so afraid. I cannot believe your difficult journey has now just become part of your life. You are such an inspiration, and I mean that. Not only you, but every one of your family members who are forever changed by your son's precious life. Hold dear to God's promises. Oh, that picture of his chest broke my heart. The thought of my kids going through all Fletcher (and you) have to go through daily is so hard. Bless you, Denise. I am praying. Also, I nominated you for a discipleship award. Come over and pick it up! As our eyes look to the Lord, and our hearts hurt for you all, and as we wipe away the tears, we know you all are in the best of Hands both in the Center and in your Lives. We will always be praying for Fletcher and the entire family as usual. The Lord IS with you always. Love, Uncle Randy and Family. A not so great Thursday!